The Golden Temple [Hari Mandir], Amritsar. bl.uk > Online Gallery Home	> Online exhibitions	> Asia, Pacific and Africa Collections	> The Golden Temple [Hari Mandir], Amritsar. 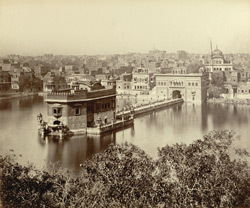 Photograph of the Golden Temple at Amritsar from the 'Lee-Warner Collection: 'Bombay Presidency. William Lee Warner C.S.' taken by John Edward Saché in the 1870s. Amritsar was founded by Ram Das the fourth guru of the Sikhs in 1577. The Golden Temple was first constructed in the 18th century and houses the Adi Granth or Original Book of the Sikhs. The temple is surrounded by a tank, the Amrit Sarovar or Pool of Nectar, and is accessed by a causeway on the west. The domed structure directly behind the gateway to the temple is the Ahal Takht, the seat of the Sikh council. The design of the temple complex is influenced by late-Mughal architecture.